To get the biggest return on our investment (let alone best help our merchants, environment, health and safety), we need to build a protected bike lane and sidewalk along the entire corridor. Doing so will mean anyone can safely cycle and walk to Peabody Field, the Manors, the Inner Village, Sleepy Hollow High School, Middle School, the farmers market and church. Right now, everyone is forced to either drive or risk their lives riding. We can, and must, give our residents real transportation choices. 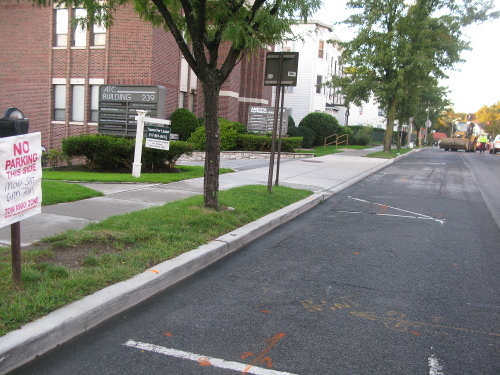 Months of Con Ed construction (see photo on left) has eliminated parking on these blocks. Sometimes the whole day. Sometimes the whole night. Everybody figured out how to deal with it. This proves how flexible people are when it comes to parking. Months of no parking on Broadway due to construction shows how flexible people are when it comes to parking. Since Route 9 is a US highway, managed by NY State, Sleepy Hollow can't do anything to Broadway. BUT, when the State Department of Transportation is working on a given road, they follow what local Comprehensive Plans say should be done with that road. Rt 9 Parking Supply and Occupancy found 0 cars parked on the east side of Broadway during peak shopping hours.